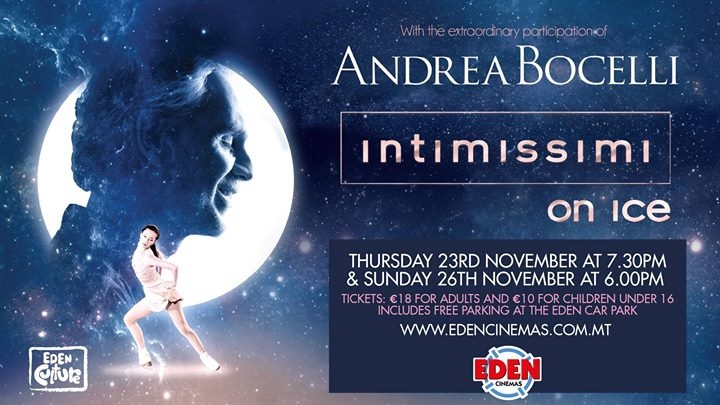 ‘Intimissimi on Ice’ has been charming the Arena Di Verona for seven consecutive years and for the first year ever it is gracing Eden Cinemas’ screens. Andrea Bocelli will star in this feature-length special event ice show where opera, pop music, figure skating and fashion combine for a breath-taking performance produced and filmed at the iconic Arena Di Verona in Italy. Shows at Eden Cinemas will be on Thursday 23rd November at 7.30pm and Sunday 26th November at 6pm. ‘Intimissimi on Ice’ combines the greatest international ice skating champions and opera and pop stars, for a night of pure Italian fashion and style. For the first time in the history of the show in the Arena, the main protagonists will be Olympic medallists from all over the world, such as Shizuka Arakawa, Stéphane Lambiel, Evgeni Plushenko, Meagan Duhamel/Eric Radford and Meryl Davis/Charlie White. Andrea Bocelli will perform live during their performances where his impeccable voice will act as a backdrop to their extravagant ice-skating and ensembles. Buy your tickets for a breathtaking show from www.edencinemas.com.mt or the Eden Cinemas Box Office.